Girls of a remote village in Pasni go far to fetch water. “CPEC is a game changer”. “Gwadar will become Dubai, Singapore and Hong Kong”. “Gwadar deep-sea port changing the face of Pakistan”. These are the statements that we often hear coming from the Govt. officials in the media about Gwadar. Let’s accept that all of this is true. 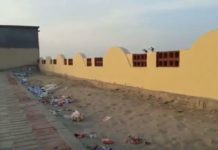 But the residents of Gwadar tell a totally different story. 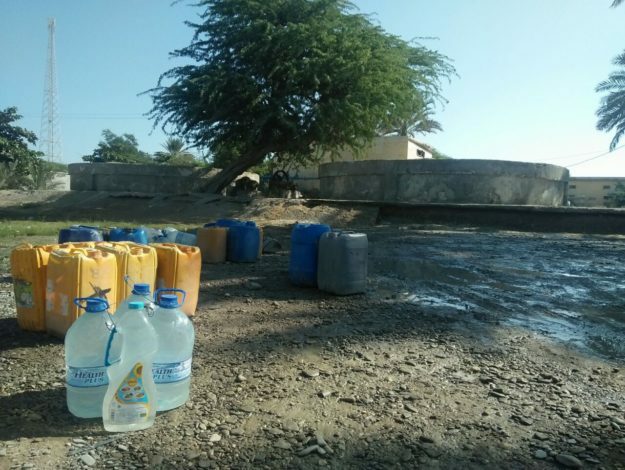 Lack of rains, poor management, lack of funds, tanker mafia’s strikes and above all lack of interest on the part of government has added to the already worsening water crisis in Gwadar district. Locals complain that If it were happening in Islamabad, Lahore, Karachi or Quetta, things would have been taken differently. 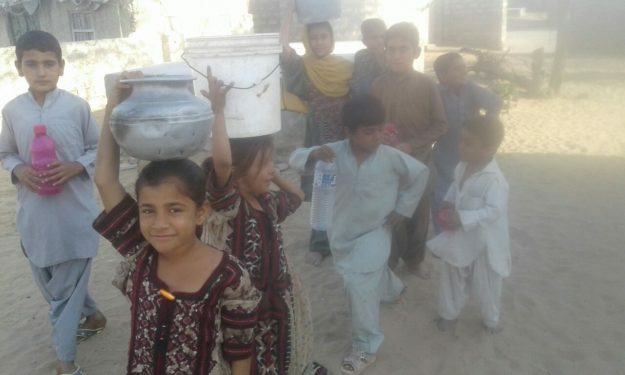 Gwadar and its sub-districts have been facing acute water shortage for the last two years. There is no end to the continuing water woes of the residents. People also get water from nearby streams in Pasni, a tehsil of Pasni. Zahir Ahmed an inhabitant of Rekpusht, Pasni, who is a worker in a fish company told Pak Voices that he receives 12 thousand rupees per month as a salary out of which he has to pay five thousand rupees to tankers, “How will I manage my finances and support my family under such circumstances?” He asks with a somber tone. 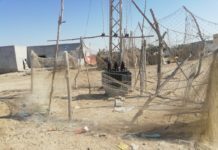 Pasni has not received any rain for the last five years, which has worsened the water crisis in the city. The residents of Pasni were glad after the construction of the Shadi Kaur dam in 2002, but after a couple of years, the dam was destroyed by the heavy rains and floods. Since then the weather changes have aggravated the situation as the dam remains dry most of the time. The drought period of the last five years has left no water in the dam, which has forced the inhabitants of Pasni to buy drinking water from the tankers at a high price of 5000 rupees per tanker (three chambers). 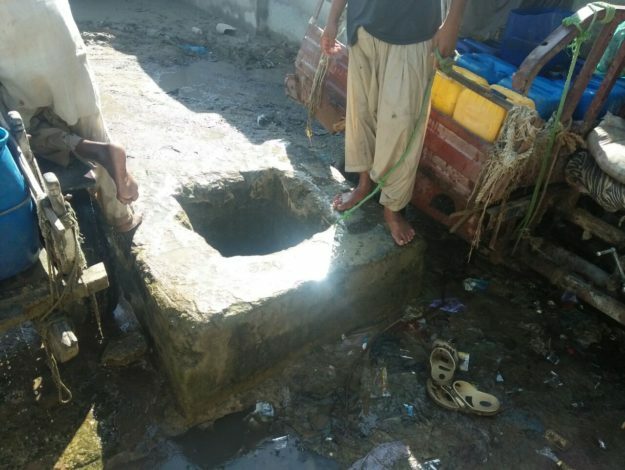 People are sucking water from a bore in Pasni. 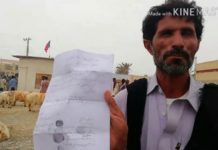 Commenting on the increased prices of water in Pasni, a tanker driver Daad Bakhsh said, “as you know there is no water left in the dam and we have to dig big holes near the newly-dried stream to obtain water, and the bulldozer charges us fifty thousand rupees for digging one hole which expires after five weeks, how will we survive if we don’t charge this to the consumers? 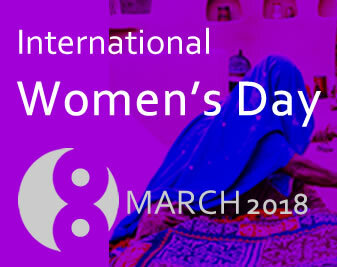 The students are also uncomfortable with the current water crisis, as rather than focusing on their education they are focusing on where to get water for their homes. 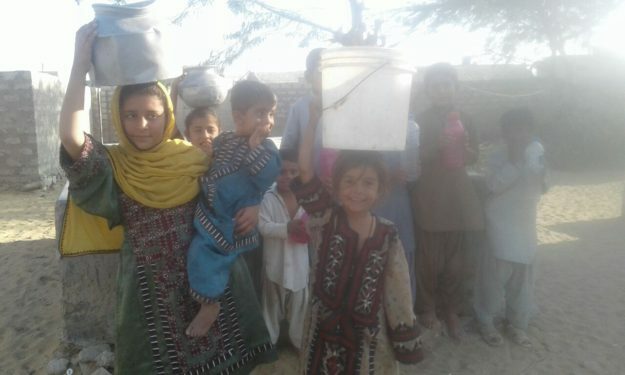 Saqia, a 12 years old student of fifth grade told Park Voices, “Today early in the morning my mom had suggested me to not go to school, as a government tanker has come to provide water at a government-built tank,” adding that there would be no drinking water at her home if she had gone to school today. When tankers don’t come, these carts come handy in providing water to the locals. 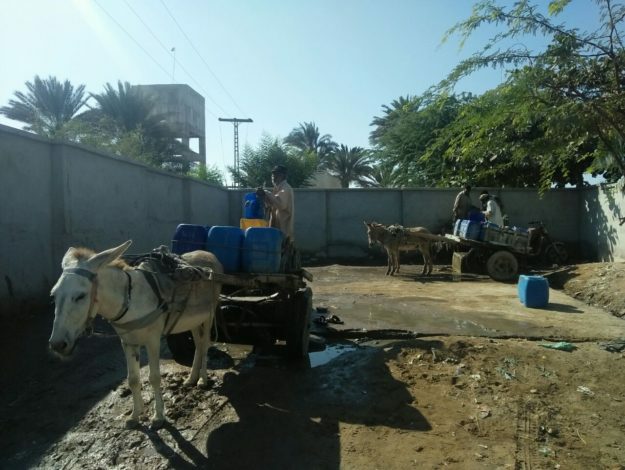 A representative of a students’ rights organization, Akram Aslam told us “The water crisis also affects the education of our children who carry bottles and roam in the streets to find water, rather than marching towards their schools”. A majority of kids leave home in the morning in search of water. 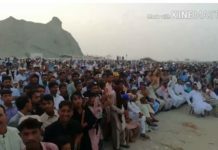 Despite people’s strikes and demonstrations regarding water crises in Gwadar, there is no hope in sight. 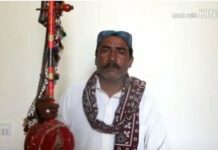 Badil Baloch is working with Pak Voices as a citizen journalist from Pasni, Gwadar.